This morning I bounced up bright and early and went to the Mass at Dawn. That is something I have never done. I always saw it in the missal but I never knew who went to it. Today I found out it was the regular 9 a.m. Mass I always go to, the Mass in Latin. It is like being back in the Middle Ages, is one reason I love that Mass. You get to chant reading off staves with square notes, the whole bit. Today they rang bells all through the Gloria. They did that on Easter, too. It is thrilling to hear. But being relatively new to the Latin Mass I sometimes find myself in situations. That is what happened to me today. After Mass everyone lined up the church's center aisle. I didn't know why. It turned out we were lining up to kiss the Baby Jesus. Father Secondo was holding this doll-like figure and everyone was kissing it. Now here is what made me uneasy. I would have thought you would kiss the Baby Jesus on the cheek but when I peered over the shoulder of the person in front of me, trying to see what to do, it looked as if everyone was kissing His foot. Or His lower leg. 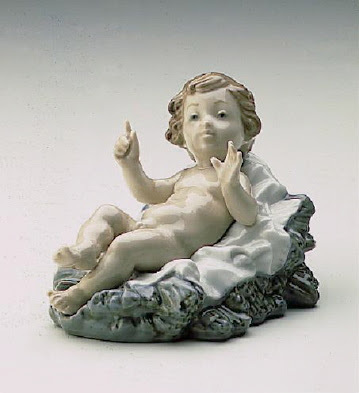 Periodically Father Secondo would take a handkerchief and that was where he would wipe off the Baby Jesus. That seemed odd, to kiss the Baby Jesus' right calf. But when in Rome! So I did that. Then I went back to my pew and knelt down. No one is ever in a hurry to get out of the Latin Mass. It is perfectly normal to hang around until it is time for the next Mass to start and sometimes that is what I do. Then we had to find out who won the raffle of the nativity scene. We did that. Now here comes my situation. All of a sudden this old woman appears. She looks to be about 95 and she is asking me if we had kissed the Baby Jesus. "Yes," I beamed. "We did." She said: "Oh, then I'm too late! Is it too late for me to kiss the Baby Jesus?" How about this? I said, "No, I don't think so. I am sure He is still here somewhere." I had not heard it announced that the Baby Jesus had left the building. I wanted to tell her that but she did not look as if she was up for a joke. Up in front Father Secondo had finished the raffle drawing and he was telling us all "Buon Natale" and then he turned to go. He is from Milan so when he is not speaking Latin he alternates between English and Italian. After a while you don't even think about it. "It is too late!" the old woman said. "No, it's not," I said. And like an idiot I had to sprint up to Father Secondo and I called out: "Padre!" His reaction time is shorter if you address him in Italian. I have learned that. Anyway, he turned and I explained the goofy situation. The woman is hanging back shyly and I had to go get her and put my arm around her and bring her up to the front so she could kiss the Baby Jesus. I should have waited around to see if she kissed Him on the foot too. Speaking of Italians I was thinking about what I was doing a year ago, when I was in California with Leonard Pennario. It is hard to believe a year has passed since last Christmas. Last Christmas was so different from this one. On Christmas Eve last year, Pennario took me out to this Italian restaurant called Sammy's. He liked that place and what I liked was he had discovered it with me. We wound up going there a lot. Sammy's was packed and everyone was loud and breaking things. Noise used to drive Pennario crazy. But the nice thing about him was that if he got into a bad mood you could almost always josh him out of it in an instant just by smiling at him or joking with him or whatever. I am sure that would not be the case with other pianists. Take the 19th century pianist Anton Rubinstein. 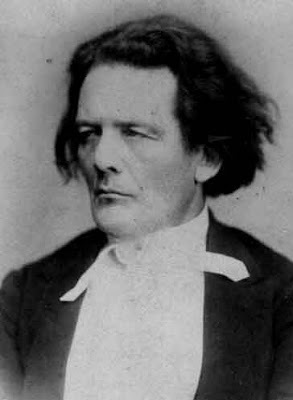 I bet if Anton Rubinstein got into a bad mood you would be stuck. Anyway, at Sammy's a year ago, the sound system started playing that pop "Feliz Navidad" which Pennario hated. He got this look. And I leaned across the table and said: "Leonard. I requested this song for you special." And the old man burst out laughing. That was how easy it was to cheer him up. It gave me a look at what he was like his whole life. That is how he was able to be this great concert pianist without losing his mind. It is just another thing that made him great.